Dr. Dan Drozdowski earned his Doctor of Chiropractic degree from Logan College of Chiropractic in St. Louis Missouri. He started working with Dr. Mack in 2008 as part of his Clinical Preceptorship. He then moved to Oregon where he worked in private practice for 5 years with his wife Dr. Stefanie. When they found out that they were expecting a baby they decided to sell their practice and move home to be near family in North Royalton. He is excited that he has come full circle to be close to his family and to be working again, with Dr. Mack. Dr. Dan has a passion for helping people to feel their best without the use of pharmaceutical drugs or needless surgery. 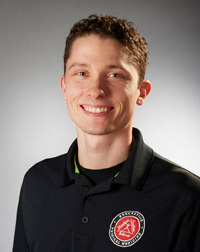 His post graduate training in Functional Movement Assessment, Motion Palpation technique, and extremity manipulation has enabled him to help patients succeed in getting results where other treatments have failed. He is thrilled to be working with North East Ohio’s best team in Chiropractic and Physical Medicine.